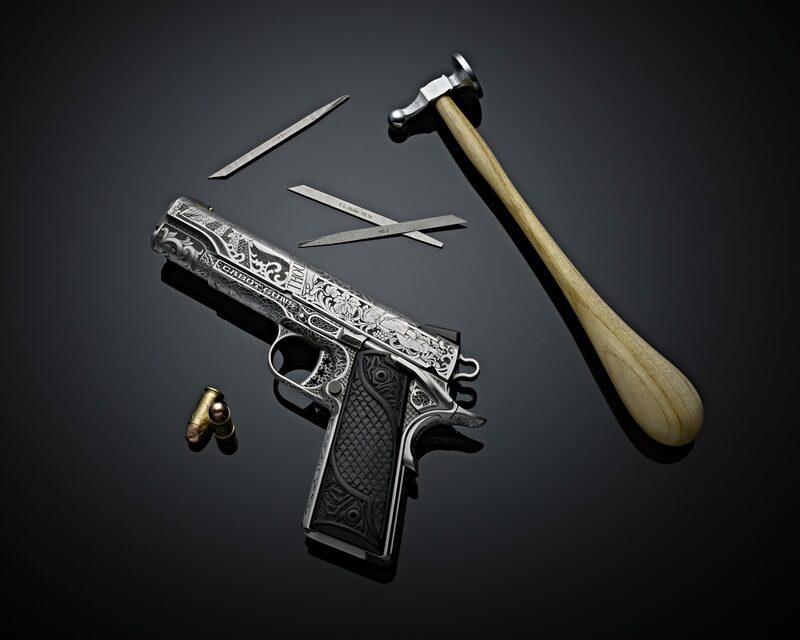 A 1911 pistol with the words “Thou Shalt Not Kill” engraved across the slide. Master Engraver Otto Carter says this piece was designed to make viewers think when they see it. “Is it warning?” Carter asks. “Is it ironic? 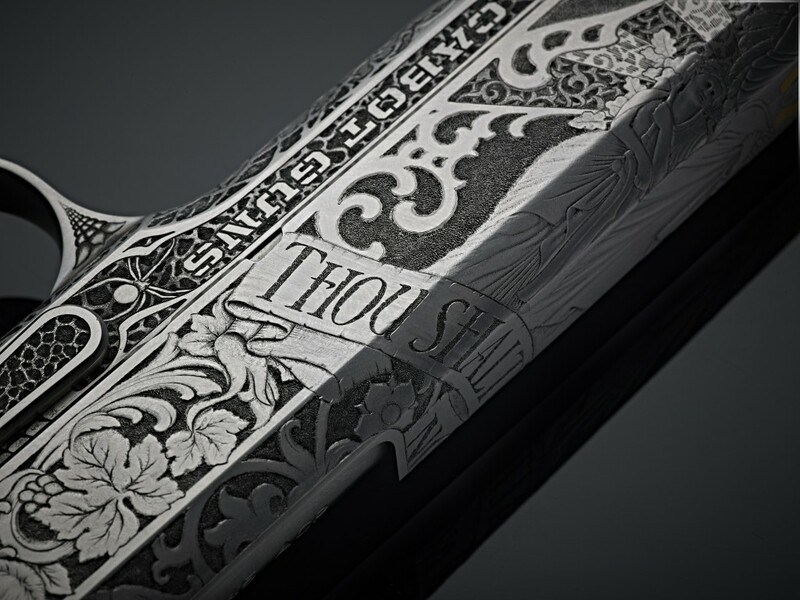 That depends entirely on your point-of-view.” One thing’s beyond doubt: the Texas-born artist has once again taken gun engraving to previously unimagined heights. “In my previous work for Cabot I focused on making a beautiful decorative yet functional object, something to delight and please the eye,” Carter says. “This time ‘round I wanted the gun to make a statement. To tell a story.” “Thou Shalt Not Kill” divides into two distinct halves: heaven (top) and hell (bottom). “Heaven” soothes viewers with three-dimensional sculpted angels (based on funereal art) and a golden cathedral window. “Hell” confronts viewers with demons (inspired by gargoyle statuary), a prison filled with tormented souls, a moonlit Grim Reaper, a spider and Beelzebub himself. 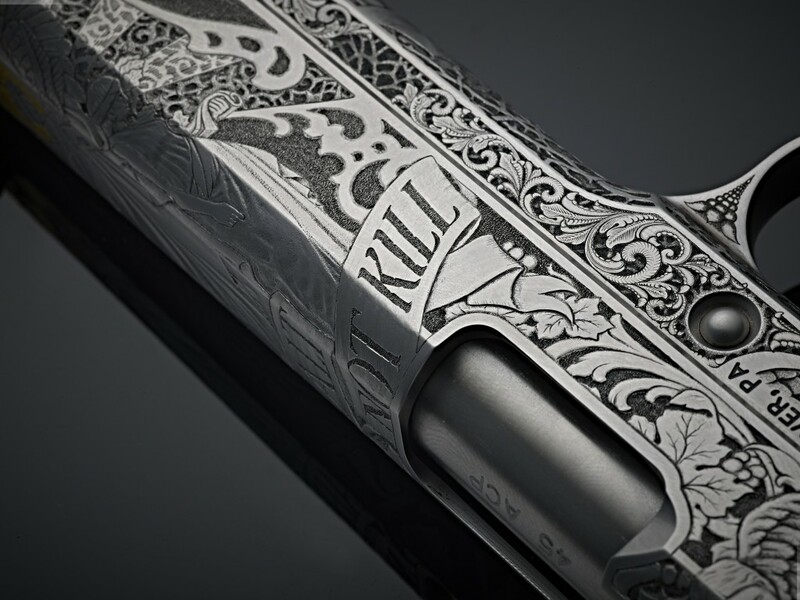 “Thou Shalt Not Kill’s” upper and lower sections, the trigger, grip safety and dust cover are all richly and meticulously embellished with Carter’s celebrated blend of textures, backgrounds and typography. 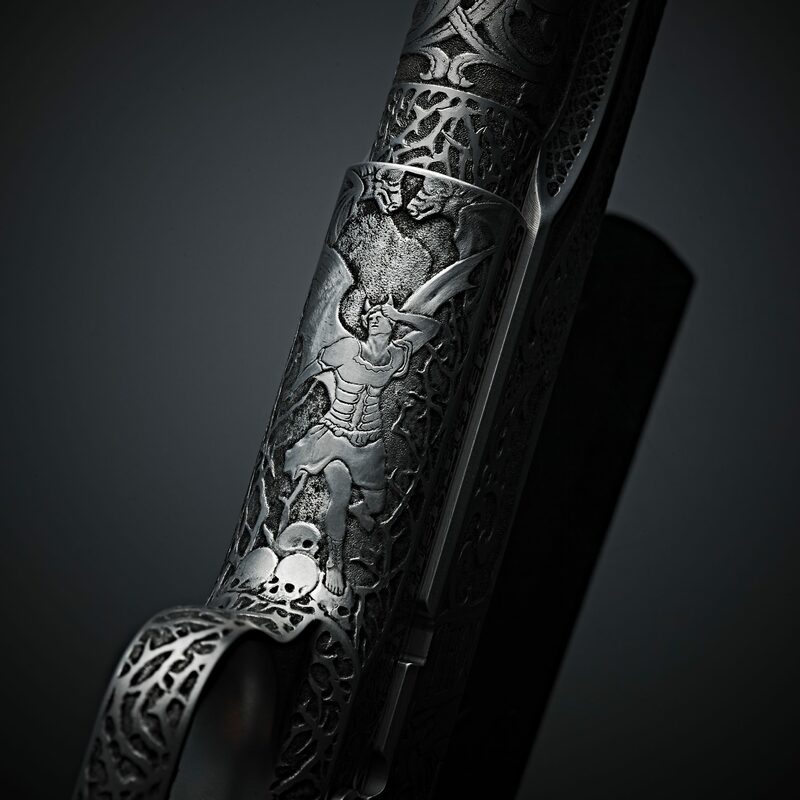 The finished Cabot Gun is a testimony to Carter’s unmatched craftsmanship and unique artistic vision, informed by influences ranging from Gustave Doré’s illustrations of Milton’s Paradise Lost to medieval church architecture. Carter’s combined Religious and Fine Art degrees prepared him for the task. But nothing prepared him for the thrill of creating the finished product.